On Friday 15th of March 2019, I was studying in a parent room at the AUT City campus Library. At 3pm Margaret Leniston, one of my scholarship officers for my Ministry of Foreign Affairs and Trade (MFAT) NZ Scholarship, sent me a message and said ‘sorry’ about the tragedy in Christchurch. I did not know what had happened at that time, so I searched for information on social media. I saw this message: ‘Innalillahiwainaliahirojiun’ (“We belong to Allah [God] and to Allah we shall return.”). At that moment, I felt a growing fear. I reflected on the stories I had heard about the lives of Muslims in the United States after 9/11; in Europe after so many instances of Islamophobia; and in areas of conflict in Afghanistan, Iraq, China, Syria, Palestine, Myanmar, and Yemen. A deep fear occupied my mind: “will Islamophobia take hold in New Zealand?” As a Muslim student, I imagined that my life (and my family’s life) would be tarnished by dark days in the wake of this tragedy. In the morning, we decided to stay home to make sure everything was fine. The information that I heard by word of mouth was that Muslim women wearing a scarf or hijab were recommended to stay home and not go to a mosque. I pushed myself to recover enough energy to finish the previous days’ work. Outside of my small room, I listened to the noise from police helicopters. They were very close to us, not like other days. I realized that the police helicopters tried to reassure us that we were safe here. 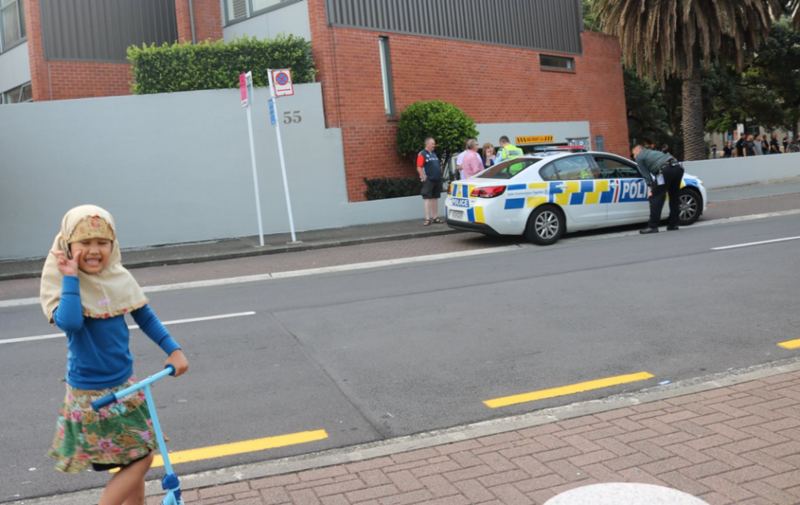 The security in New Zealand had shifted from low to high alert. Both of my supervisors, Sari Andajani and Sharyn Graham Davies, contacted me. They made sure my family and I would be fine, and asked if I needed anything. 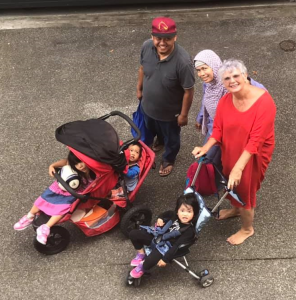 One of them said “Hi sayang (honey), I am around with a car if you need anything.” They are an amazing part of our family journey at AUT, beyond the usual supervisors’ role. One two three… I love all! I uploaded a video of her to my Facebook to reassure our friends and families that we are fine here; we are safe here. Nothing changed. No one stared at us, and my daughters decided to wear their beautiful hijabs. It was just like many other colourful days in New Zealand that we have passed over 3 years during my PhD study. New Zealand media decided not to show videos about the tragedy. They blurred the image of the perpetrator, and focused on informative and positive messages. Nevertheless, I replied to hundreds of messages and responses from our friends and family in Indonesia. They were still shocked about the tragedy – especially as the video spread quickly, even in Indonesia, which is majority Muslim. 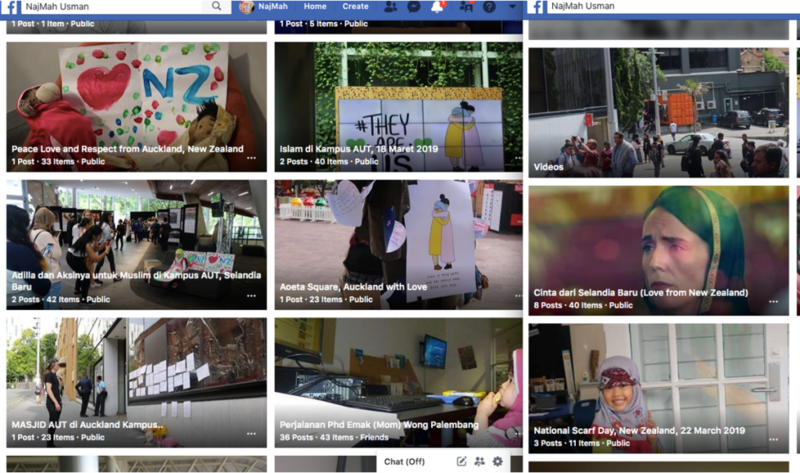 We tried to upload some pictures to show that we are fine in New Zealand, and to counter negative information and hatred. I was invited to my scholarship officer Margaret Leniston’s house for breakfast. My children call her ‘Grandma’. We walked together and saw that Auckland was in mourning. It was Sunday. Not many people went outside their homes. After the tragedy, Auckland looked to be in ‘silence mode’. 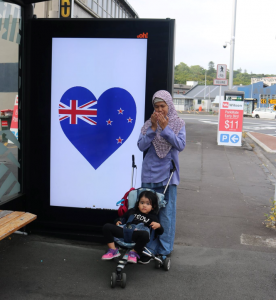 We saw that at each bus stop, there was a sign of love with the New Zealand flag and the background changed from black to white, vice versa. 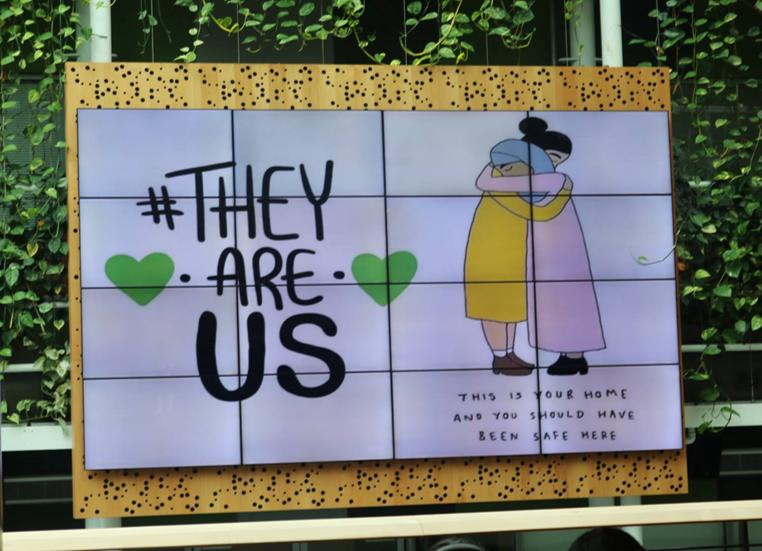 I felt how New Zealanders provide us a ‘supportive environment’ after the tragedy. Auckland is not close to Christchurch – it is on a different island from us. But the New Zealand government provides supportive zones for Muslims all over New Zealand. Thank you New Zealanders for your love for us. Tears dropped from my eyes. 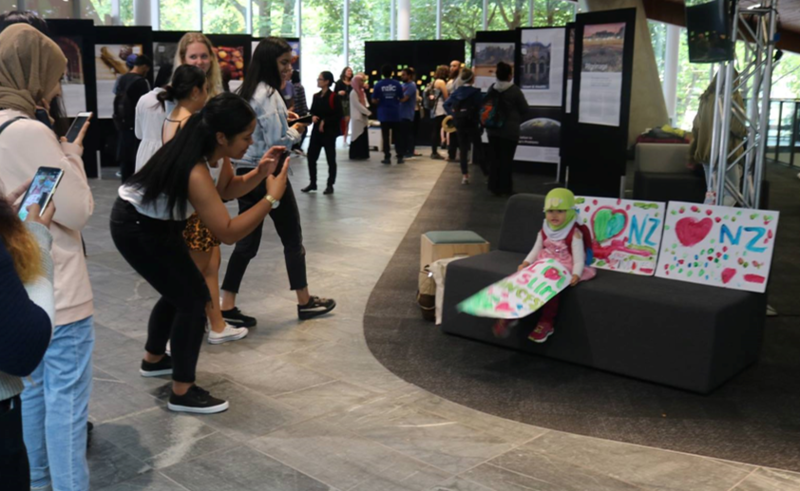 That day, there was one minute of silence that was attended by AUT’s Vice Chancellor Derek McCormack, the President of the AUT Muslim Students Association Mohamed Soliman, Chaplaincy Coordinator Linda T. Hope, and other AUT leaders, staff, and students. 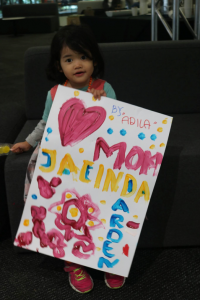 During the event, my daughter Adilla held up a picture that she drew at her childhood centre. More than 100 students took her picture. Finally, she felt tired and pretended to sleep. She, a Muslim princess, was being loved by others. Adilla and I went to University. Being a mother and a student, my favorite room is the parent room – a space for me to study and for my children to play where we won’t disturb other students. At lunch time, Adilla shared her drawings and put her dolls in the reflection area in WG building. She put a hijab on her doll. She chose to play with Fatima, another AUT Muslim student from Saudi Arabia. Then, Adilla chose to put her drawings in the AUT library, and one staff member from the library helped her to stick it on the wall. At lunch time, my friend Lisa Waldner, who I met during an AUT writing retreat, contacted me and wanted to see me at AUT. We met in the library and she brought a lovely flower for me and my kids. After arriving home, my daughters said “I love the flower Mommy!” I told them to say thanks to Aunty Lisa. I decided to study at home. I wrote some stories about our life and uploaded some pictures through Facebook. I thought it is my responsibility to clarify some misconceptions about the tragedy, and let the world know that New Zealand protects the Muslim community, and creates a safe zone especially for Muslim communities, international tourists and other New Zealanders. Some Indonesian friends told me via social media that the Haka dance had inspired the world, and embodied the spirit of unity in New Zealand. The Haka dance is an integral part of Maori and NZ culture, and communicates goodness, love, empathy, and respect for all victims of the tragedy. My daughter Queency was happy. Her teacher sent an email to say that this Friday is a colourful day, and to bring coins for donation. She was so excited to wear her colourful clothes with her hijab and one flower from her Aunty Lisa. Some New Zealanders respected Queency and my husband during their journey to Queency’s school by smiling, putting their hands to their chests, and nodding respect for Islam. 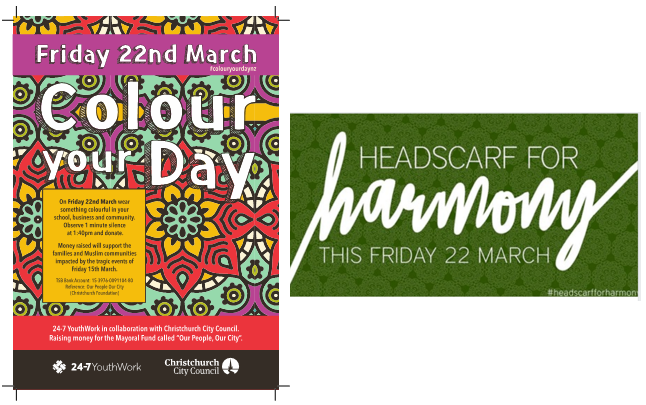 We saw some New Zealanders wearing headscarves for harmony, and we published pictures on social media. My husband went to the AUT Mosque for Friday prayers. My husband told me that everything was safe: there were police, AUT security guards, and amazing support from New Zealanders. There was two minutes’ silence not only in mosques, schools, and universities, but all over New Zealand to pray and reflect on what happened last Friday. The Prime Minister Jacinda Ardern promised to the Muslim community that it will not happen again in the future. I was worried about Islamophobia in the aftermath of the Christchurch attacks. But my fears were mostly unfounded. New Zealand differs from other countries. I think New Zealanders and Kiwis exemplify how to be great human beings. Also, New Zealanders and the people of this world should give great appreciation to the leadership that has been shown here, especially by Prime Minister Jacinda Ardern. She shows us how a great woman can solve problems with a good manner and empower others to join with her. Lastly, the world should learn from New Zealand’s ability to unite all differences if we want to create a better world for future generations. I have become one of the witnesses of life after the tragedy. 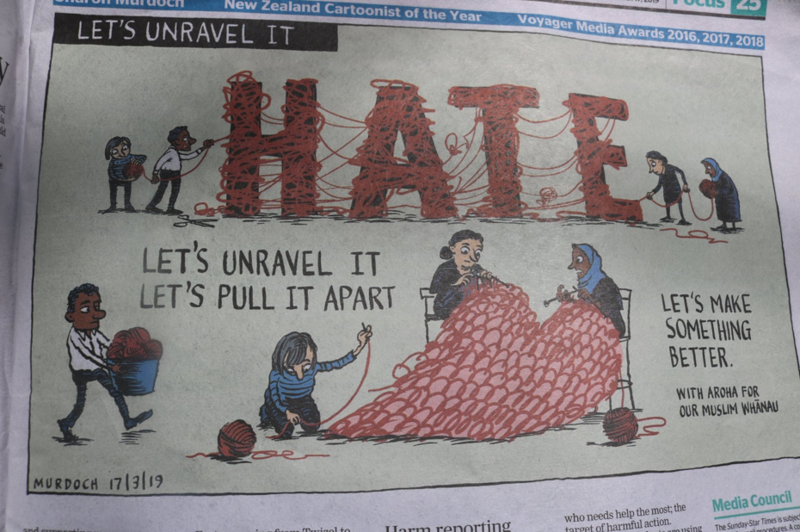 I learned some messages in New Zealand: “Islamophobia will never win”; “Destroy Islamophobia”; “They are Us”; and “Aroha”. I am a Muslim international student with my family in Auckland, New Zealand. Najmah is a lecturer at Sriwijaya University in South Sumatera Indonesia. She is currently a PhD candidate at Auckland University of Technology (with a New Zealand ASEAN scholarship). She is also a writer, blogger, and a feminist. She is an expert in both quantitative and qualitative research and has published four books related to Epidemiology and Biostatistics. Previously she was awarded an Australian Partnership Scholarship and a Netherlands Fellowship Partnership.